I have a worrier. I should have expected it, after all, I am a worrier. To be exact, I have Anxiety Disorder. You would think that I could understand my child more because I too suffer from this issue. But would you believe me when I say that it actually makes it much worse? I know why they feel this way, but since I have no control over my own emotions, fears, and anxieties I have no idea how to help them, deal with theirs. It is a terrible feeling being unable to help your child deal with something you cannot even deal with. Since my kids are returning to school soon, I wanted to help my worrier be ready and find some ways to deal with things. I found this really helpful teacher set from Teachers Pay Teachers. 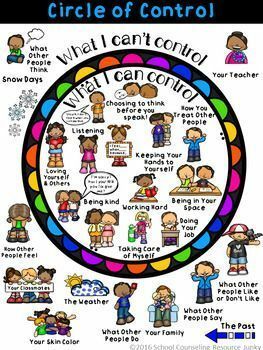 It is meant to help teachers show their students how to deal with emotions in the classroom, but I have found it to be a very helpful tool at home as well. I ordered the digital version and printed it out at home. We put it in the bedroom and it has helped my worrier to visualize what they can and cannot control in their world. He and I look at it when we are in the midst of an anxiety episode. We see what we can control, and remind ourselves what is outside of our control. And we talk about what we can go do instead to ease our worry. We even made a list of ways that we love to ease our fears and anxieties. Now we are on our way to helping one another deal with our overly active emotions. This entry was posted in Activities, Health, Learning and tagged anxiety, anxiety disorder, children with anxiety, classroom guides, emotions, helping kids, in our contorl, learning, Teachers pay teachers, the boys store, worrier. worry on August 4, 2018 by Lacy.